CVE-2006-6456 Unspecified vulnerability in Microsoft Word 2000, 2002, and 2003 and Word Viewer 2003 allows remote attackers to execute code via unspecified vectors related to malformed data structures that trigger memory corruption, a different vulnerability than CVE-2006-5994. This is an old exploit targeting systems that have been unpatched for a long time. It appears that the document was created using 2007最新DOC捆绑器 (thanks to zha0 for helping translate and spell the tool name). The tool can be easily found online and is designed to exploit CVE-2006-6456 / MS07-014 vulnerabitly. According to the Symantec post describing this tool in April 2007, shellcode in documents generated by the tool usually starts at offset 0x16730, which seems to be our case too. The exploit will not work on Office 2003 SP3 and earlier versions with MS Update kb 929434 (MS07-014). CVE-2006-2492 Buffer overflow in Microsoft Word in Office 2000 SP3, Office XP SP3, Office 2003 Sp1 and SP2, and Microsoft Works Suites through 2006, allows user-assisted attackers to execute arbitrary code via a malformed object pointer, as originally reported by ISC on 20060519 for a zero-day attack. From: macnews [mailto: macnews@mac.gov.tw]Sent: Saturday, February 20, 2010 10:49 PMTo: XXXXXXXXXXXXXXXXXSubject: MAC list of the week itineraryHello!Attachment file for the Mainland Affairs Council, a list of one week trip (new 2 / 17 Lai, chairman of the stroke) news references for your reference! I do have a lot of older messages and malware items to post and I have not been posting many for the lack of time during the past week. I will soon. I wish everyone Happy New Year. Please accept our best wishes for the year of the Tiger. Mar 5 hxxp://www.sciences-po.org/ contains HTML/ScrInject.B.Gen virus. Feb 24 hxxp://www.raktor.net/exeHelper/exeHelper.com contains probably a variant of Win32/Agent trojan. Feb. 16 hxxtp://google.analytics.com.zelhnalbivd.info/kav/kav3 .asp/eHbcb9bc6cV0100f070006R111090bf102Tf7c2bdef201l0409K80667147318J130204010 contains a variant of Win32/Kryptik.CKT trojan. Feb. 05 hxxp://klaikius.com/news/index.php contains JS/Exploit.Agent.AGC trojan. Feb. 05 hxxp://arra.servehttp.com/nc.jar contains multiple threats. 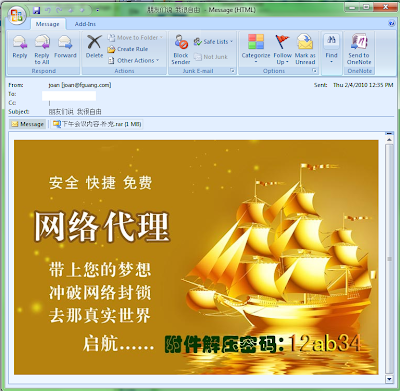 Feb. 05 hxxp://yvuxksuk.cn/10/andEthics.jar contains probably a variant of Java/TrojanDownloader.Agent.AB trojan. Feb. 5 hxxp://klaikius.com/news/index.php contains JS/Exploit.Agent.AGC trojan. Feb. 5 hxxp://huliganseres.net//pdf.php contains JS/Exploit.Pdfka.NQQ trojan. Feb. 5 hxxp://www.cald.org/site/js/ddaccordion.js contains JS/TrojanDownloader.Agent.NRO trojan. Feb. 5 hxxp://www.drr.gov.bd/ contains JS/TrojanDownloader.Agent.NRL trojan. Feb. 5 hxxp://www.reflecttass.com.br/unicor/MailboxMicrosoft09328.zip contains a variant of Win32/TrojanDownloader.Banload.OEL trojan. hxxp://www.reflecttass.com.br/unicor/MailboxMicrosoft09328.zip contains a variant of Win32/TrojanDownloader.Banload.OEL trojan. The following files are available for research upon request. Please check the malware list first, some of them are already listed with download links. All these files were scanned with Virustotal. Use VT hash search for more details. I will add more files later. These files are available for research upon request. All these files were scanned with Virustotal. Use VT hash search for more details. These binaries are part of various trojans and malware kits. Full kits / programs / sources are available for research upon request. According to Villy (thanks, Villy :)) the file contains two embedded pdfs - one small with js exploiting CVE-2009-4324 and one larger clean file. There is also a xored exe between those two files. It is a very nice package. Attached is an invitation for a February 15 reception honoring Rep. Mike Castle (R-De) in his candidacy for the U.S. Senate. I hope you will be able to join us. Although his expected Democrat opponent has dropped out of the race, the New Castle County Executive has already announced his intention to seek the Democractic nomination. Hence, Mike's political situation is strong, but the Democrats are expected to make a full scale contest out of this race. Presuming your support, Mike will make a great contribution in the Senate for Delaware and the Country. NOTICE: This email message and all attachments transmitted with it are intended solely for the use of the addressees and may contain legally privileged, protected or confidential information. If you have received this message in error, please notify the sender immediately by email reply and please delete this message from your computer and destroy any copies. IRS Circular 230 Notice: To comply with U.S. Treasury regulations, we advise you that any U.S. federal tax advice included in this communication is not intended or written to be used, and cannot be used, to avoid any U.S. federal tax penalties or to promote, market, or recommend to another party any transaction or matter. CVE-2009-4324 Use-after-free vulnerability in the Doc.media.newPlayer method in Adobe Reader and Acrobat 8.0 through 9.2, and possibly earlier versions, allows remote attackers to execute arbitrary code using ZLib compressed streams, as exploited in the wild in December 2009. Mikko Hyppönen from F-Secure posted today a nice postcard with a cute tiger and flowers. Gunther (thank you:)) sent one just like Mikko's as a present to Contagio and now you can enjoy them too. What is interesting is that I have this file already except I received it as a boring "project.pdf" (Jan 13 CVE-2009-4324 Re: Project from spoofed [Redacted]@state.gov 13 Jan 2010 06:17:21 -0000). 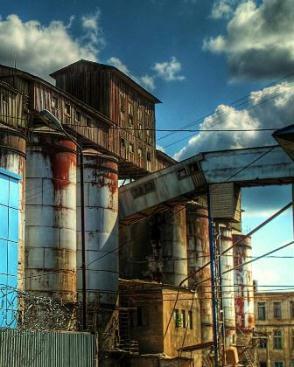 Of course it is identical to the postcard, despite the uninspiring name. F-Secure already pointed out that it generates traffic to 202.150.213.12. The GetFileSize filehandle brute force is not exact, but it additionally checks for signature "0x909083c0" at 0x1510 (location of 2nd stage shellcode). 2nd stage shellcode: xor decrypts itself (0x97) for 0x700 bytes. skip decryption stub (0x1b) and xor the rest with 0x97. The last byte of the size (0x6E) is used as xor key, on every byte the key is decreased with 1. After that the embedded pdf is decrypted, Acrobat reader starts while the old process gets terminated. I see multiple searches for Hydraq MD5 information leading to this post -Trojan.Hydraq detection and naming so I am adding a few things now. McAfee issued a guide outlining all the symptoms of Aurora infection "How Can I Tell if I Was Infected By Aurora?" * Password protected archive, please contact me for the password if you need it. I will tell you what it is, if you don't know and I will seek more information if you have. This is just an exe (PE32 executable for MS Windows) in zip archive. From China and connecting back to China. Not very creative. PORT-AU-PRINCE, Haiti (AP) - Desperately needed aid from around the world slowly made its way Thursday into Haiti, where supply bottlenecks and a leadership vacuum left rescuers scrambling on their own to save the trapped and injured and get relief supplies into the capital. If you have read Paulson's comments, you know how ridiculous Obama's $3.8 trillion budget is. Please do not vote for members of support budget in November's elections. 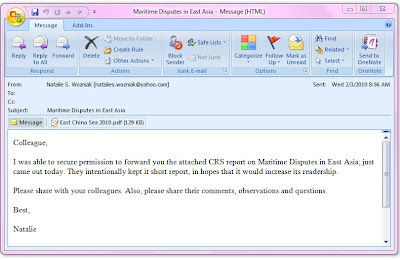 I was able to secure permission to forward you the attached CRS report on Maritime Disputes in East Asia; just came out today. They intentionally kept it short report, in hopes that it would increase its readership. Please share with your colleagues. Also, please share their comments, observations and questions.